"Democrats Hold Bash In The Community Of Amado"
Arizona Democrats gathered Sunday at Placita del Sol and Kristofer’s Bistro in the Santa Cruz County community of Amado. 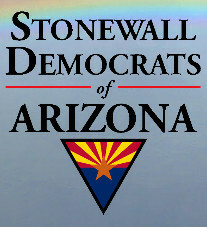 Robert Rowley, chair of the pro-LGBT Stonewall Democrats of Arizona, described it as “one of the biggest Democratic events in recent history held in that part of the state.” He estimated the standing-room-only crowd at 250 to 300. Rowley is pictured, at left in the photo, with longtime Arizona politico Terry Goddard, this year’s candidate for secretary of state. Moderating the event was state Sen. Paula Aboud of Tucson; others attending included Fred DuVal, candidate for governor; Felecia Rotellini, candidate for attorney general; U.S. Rep. Raul Grijalva; U.S. Rep. Ron Barber; David Garcia, candidate for superintendent of public instruction; state Rep. Bruce Wheeler, House minority leader; state Rep. Demion Clinko; Jim Holway, candidate for Corporation Commissioner, and many others.